On Oct. 4, 2012, The Carrboro Citizen bid adieu to the community it had covered relentlessly for the past five years. Relying solely on advertising and personal resources for its funding, the newspaper was more of a financial burden than could be accounted for, said Connie Cohn of the Friends of The Citizen. Many Carrboro residents were saddened when The Citizen was forced out of print. In the weeks following the paper’s folding, Randee Haven-O’Donnell, a member of the Carrboro Board of Aldermen, began spearheading the efforts to revive The Citizen. From those efforts came the Friends of The Citizen, a group of individuals who want to see The Citizen brought back to Carrboro community. 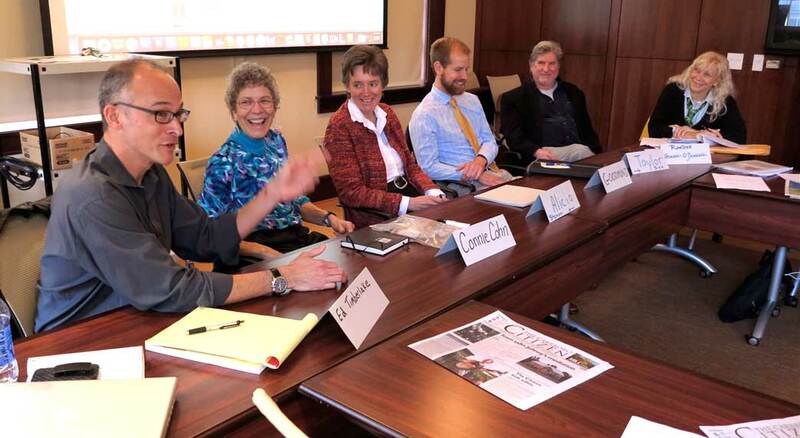 The group is leading the effort to relaunch The Citizen as a non-profit paper. The board of directors is comprised of President Goodmond Danielsen, founder Randee Haven-O’Donnell, Bob Saunders, Allen Spalt, Jock Lauterer, Connie Cohn, Julian Sereno, David Jessee, Peter Lee, Alicia Stemper, Taylor Sisk, Smitha Katragadda and Ed Timberlake. According to Cohn, in Oct. 2012, the Friends incorporated as a non-profit and began to pursue 501(c)3 status. If this pursuit is successful, The Citizen will be a pioneer in the industry of non-profit community journalism. In Dec. 2012, the Friends signed an agreement with The People’s Channel, who will act as a fiscal sponsor during the interim period of application for the 501(c)3. Having The People’s Channel serve as their umbrella organization allows the Friends of The Citizen to begin to receive and dispense funds, make donations tax-deductible, and allows the group to apply for grants. Additionally, the Friends are currently working to reach an agreement with Dickson on obtaining the use and assets of The Citizen. “Asset acquisition is part of our first fundraising goal,” Cohn said. The Citizen first came to publication in 2007 thanks to the efforts of Dickson, a small core staff, and a number of local contributors. According to Haven-O’Donnell, the original paper was very much a community effort. The leadership was engaged, educated, and socially conscience. “We launched The Citizen at a time when it seemed crazy to a lot of people to be starting a print newspaper, the industry being in the condition it was, and is, in,” Taylor Sisk said. While Sisk and others recognized that the financial backing for The Citizen wasn’t quite there, they also recognized that the support from the community was extensive. According to Peter Lee, the old Citizen was distributing 7500 copies per week. “[This] demonstrates a demand for locally owned, web [and] print news publication, and I want to rekindle and fan that passion,” he said. Goodmond Danielsen was drawn to Carrboro in part due to the quality he found in The Citizen as a paper. “It’s hard to get a really high-quality journalistic paper in front of you,” he said. Lauterer says that the relaunch of The Citizen will look as much like the “old” Citizen as possible, with as many of the former staff as can be mustered. Many in the Carrboro community will also be excited to learn that the popular Ken Moore column, “Flora,” is expected to reappear in the newly launched paper. According to Cohn, The Citizen wants to partner with Lauterer’s community journalism classes in the future. “The other side of what The Citizen will be doing is providing an outlet for student reporters,” Cohn said. At this time, donations toward reviving The Carrboro Citizen should be made payable to The People’s Channel, with “Friends of The Citizen” in the “For” notation on the check. Donations are tax-deductible. For more information, interested readers may contact Jock Lauterer at 919-962-6421 or jock@email.unc.edu, or Connie Cohn at 919-951-8736 or conniecohn@gmail.com.